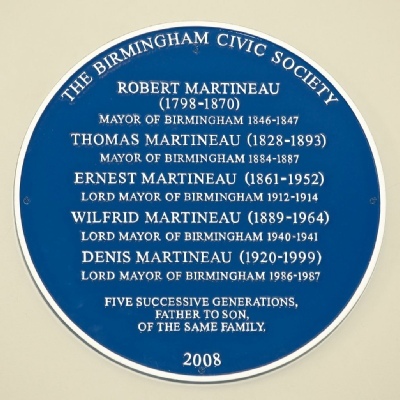 Sir Thomas Martineau was of the second generation of the Birmingham branch of the remarkable Unitarian Martineau family. Sir Thomas was educated from the age of 10 at the Edgbaston Proprietary School (his father was one of its founders) until 1844.He then studied law in the firm of his relative Arthur Ryland and eventually became a solicitor and partner in new firm of Ryland and Martineau in 1852.and continued to practice for over 30 years. He became an idealistic chairman of the Birmingham Law Society and was the Hon. Sec of the Midland Institute. As a member of the Edgbaston Debating Society he met Joseph Chamberlain who encouraged him to enter local politics. Sir Thomas then became an enthusiastic participant in the great Liberal reforms which pioneered by Joseph Chamberlain, William Harris, George Dawson, Robert Dale, George Dixon and others transformed Birmingham into ‘the best governed City in the world’. Their zeal was underscored by a Non-conformist belief in a ‘Civic Gospel’ - a Christianity expressed in social reform through the agencies of local government. Sir Thomas, like Chamberlain, was a committed Unitarian. Sir Thomas had been a committee member at St. Peter’s Ward and in 1876 was elected Councillor the Market Hall Ward where he served until 1886. His abilities were quickly in evidence particularly providing legal expertise to the Parliamentary Committee of the General Purposes Committee overseeing the Consolidation Bill which gave extra powers to Birmingham to develop its Free Libraries, Museum and its School of Art. He also served on the Estates and Free Libraries Committees and importantly the Water Committee. By 1883, he was made an Alderman and from 1884 to 1887 served as Mayor. In 1887, as Chairman of the Water Committee, he collaborated with Joseph Chamberlain in Parliament and with hard work and perseverance overcame multiple difficulties to drive forward the Bill that led to the construction of the Elan Valley reservoirs which provide water to the City to the present day. He was knighted by Queen Victoria in 1887 following her visit to lay the foundation stone of the new Victoria Law Courts which Sir Thomas had also worked to create. Sir Thomas was also involved in numerous activities including being a Justice of the Peace, a Governor of the Midland Institute, a Trustee of the Art Gallery’s Picture Fund and helped to found Warwickshire County Cricket Club. Sir Thomas died in 1893 at the age of 65 following a descent into ill health. He is buried in Key Hill Cemetery with his son John and his wife Emily (nee Kenrick) in Grave Site K134 close to the grave (I 790) of his father and mother, his brother Cllr. Robert Francis Martineau and his sister, the illustrious Harriet.